In June I visited Berlin, Germany to meet with renowned street photographer Martin U Waltz. For all of you that don’t know Martin U Waltz he is one of Germany’s most well known street photographers with international fame. His work has been exhibited in different countries and he has been interviewed numerous times. At the time of this video, Martin had released 2 books about street photography. You can find out more about him and his work on his website www.streetberlin.net. While I was in Germany I managed to record a new Street Hunt video that I shot with the help of my mate and fellow photographer, Yiannis Fragkakis. So the 3 of us, Martin, Yiannis and myself enjoyed a day of talking and shooting in Germany’s capital. I hope you enjoy it! It was a beautiful warm and sunny Saturday. We met with Martin early in the morning for a coffee before we started our walk. We did some catching up because it was around 8 months since our last meeting, we enjoyed a snack, talked about the city of Berlin and once we were ready, we took off. As you will see later in the video, we did more talking that shooting, but the discussions were quite interesting. We discussed about the laws concerning street photography in Germany and at one point we dived into the GDPR in street photography. So, if you are interested in these topics you are bound to enjoy the Berlin Street Hunt. ATTENTION: Berlin is a much noisier city than I realised. This is something that I hadn’t noticed during the time I was shooting. I thought that my standard setup would have been enough, but it seems it wasn’t. I have tried to engineer the sound to make the voices clearer, but it isn’t great. So, please accept my apologies beforehand. I have left Berlin with good impressions. Although I didn’t get many keepers, I feel that if I had more time in that beautiful, free spirited city, I would have definitely captured more photos worth sharing. I was shooting with a new camera, I was there for only about 72 hours and I left just as I was getting in tune with the Berlin vibe. I needed one more day! Nevermind, I will be going back again, I know it. I enjoyed it a lot! For all of you that want to try Berlin for street photography, I highly recommend it. People are chilled, I didn’t have any difficulties shooting and I really loved how everything was stress free, at least where I was staying. Oh and beers there are awesome as you would expect! In this video I am using the Fujifilm X100F that was given to me for a review from Fujifilm Hellas (Greece). It has a fixed 23mm prime lens that is equivalent to a 35mm full frame lens. In addition I am using the Fujifilm EF-X20 flash. For my off-camera flashing I am using a cord to connect my flashgun to my camera towards the end of the video. I wish I had the time to write more about my days in Berlin, but unfortunately that isn’t possible. I have managed to squeeze my experience into a 32 minute video. So this is going to be a good one guys! I hope you have got your favourite beverages ready and you are comfortable. 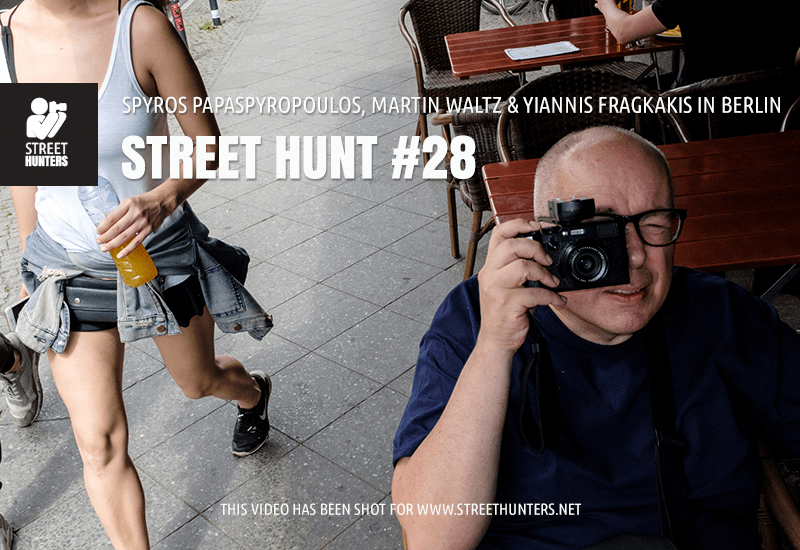 If you are ready press play and enjoy the Berlin Street Hunt video! If you want to check out each photo I have uploaded every image I shot in a dedicated Dropbox Album called Street Hunt 28.